Most students fear the speaking part of the IELTS exam, although this is the most interactive and easy one to crack. As here you will be tested on your speaking skills. 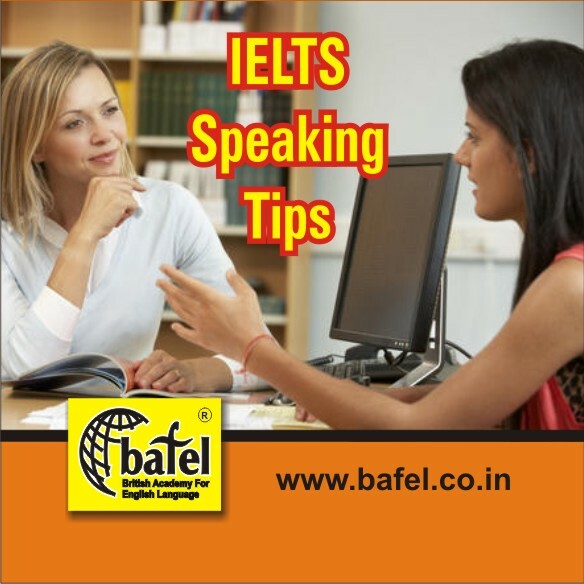 When you are facing the speaking part of the IELTS exam make sure to avoid giving answers in yes/no, as this cuts your opportunity to show your speaking skills. IELTS trainers at BAFEL advise you to make sure to speak grammatically correct sentences and maintain the accuracy throughout the test. While you are asked to speak about a topic try to pronounce each word clearly, as wrong pronunciation can cause negative marking. The Trainers at BAFEL train you to speak with confidence and without any nervousness or hesitation. BAFEL has many centres all over Delhi / NCR some of its centres are located in Dwarka, Tilak Nagar, Chirag Delhi, Patel Nagar, Punjabi Bagh, Connaught Place, Noida, Faridabad, Gurgaon, Amritsar, Jalandhar and Kukatpally, Hyderabad etc.